And you have undeniable proof of this, not just heresay? Any Witnesses? A conviction perhaps? Or just cuz you say it is so? Court documents? Proof beyond a reasonable doubt that this indeed is a fact? aren't clintons own emails proof enough? the emails she deleted but were found, which showed that the benghazi ambassador had asked for extra staffing? and she refused? where the pentagon had offered to send in troops...and she refused. of course, it's still just speculation at this point about whether the next batch of emails will confirm that she deleted intelligence showing that the benghazi attack was funded by saudi arabia, but i guess we'll find out more about that soon enough. please bear in mind these people are running for the highest democratic office in the world. 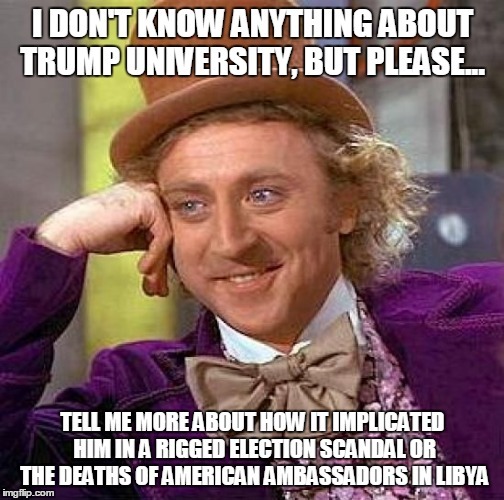 and you think cheating people out of money makes him worse than someone who rigs a democratic nomination process? 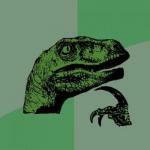 Apparently it doesn't count because..........hmmmmm........I jus.....uhhhhmmm...I'm f**kin stumped. One of illegal. That's violating US code section 793. Please look things up before making stupid memes. you think i'm going look up US code section's to make a meme? 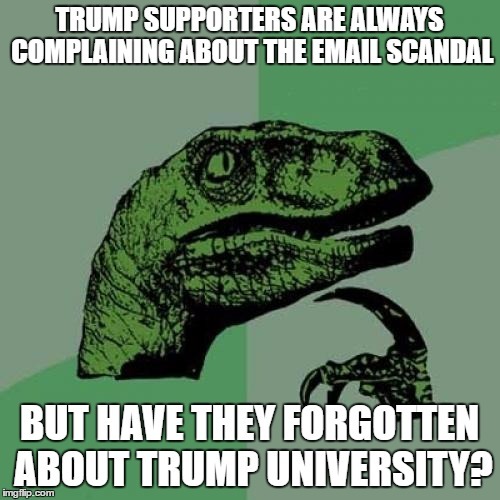 TRUMP SUPPORTERS ARE ALWAYS COMPLAINING ABOUT THE EMAIL SCANDAL; BUT HAVE THEY FORGOTTEN ABOUT TRUMP UNIVERSITY?